This custom scientific illustration was created to accompany a research grant and journal article written by Dr. Tapinos. 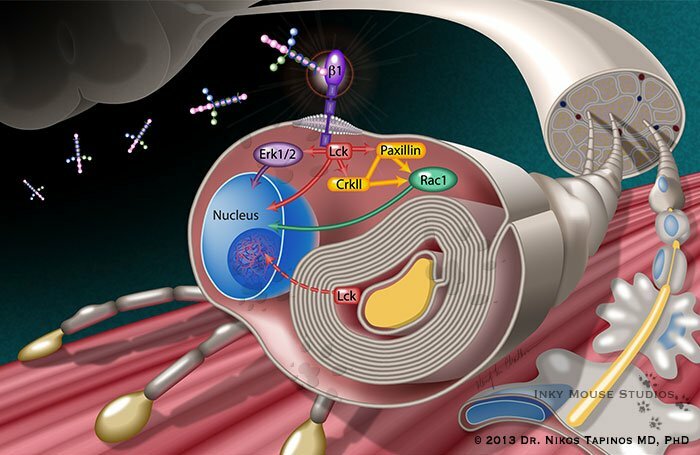 The Lck (lymphoid cell kinase) driven pathway is the primary focus of this illustration. This important pathway regulates the dedifferentiation of Schwann cells during myelination, migration, and differentiation. Schwann cells are unusual due to the fact that they possess the ability to dedifferentiate back into a more immature stage if the nerve axon they are myelinating is somehow damaged. This ability to dedifferentiate, migrate and myelinate, is critical to the regrowth of damaged nerves in the peripheral nervous system. This illustration was an exciting challenge for me to create. Scientifically speaking, I had to illustrate how the Lck pathway works. Biologically speaking, I needed to show the structure and behavior of the Schwann cell in situ, and provide a visual framework to contain the Lck pathway elements. To be successful, my illustration needed to tie these two complicated elements together accurately and clearly. In conclusion, the end result was a client who was very happy with this dynamic illustration that would captivate the viewer and make them want to read more about his research.